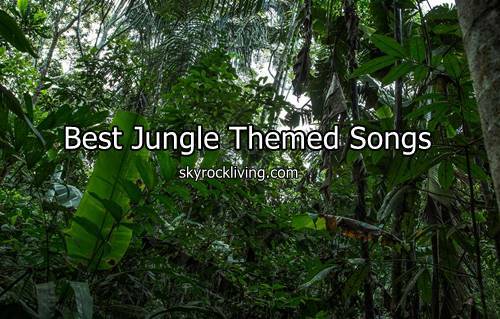 Best jungle themed songs – Songs is not only about love, friendship or life, but also about nature. Some artists draw attention with create songs about jungle and whatever inside it such animals and wildlife. There are some jungle related songs from past to date and contain animal lyrical theme. Some of best jungle songs become popular songs too and even become massive hit. It’s easy to find love themed songs or friendship themed songs, but not many jungle themed songs. But rare doesn’t mean don’t exist, as our search find more than 30 best jungle tracks to present. These jungle animals songs are diversed by many genres, whether rock, pop, hip hop, R&B and even reggae. Some artists also create jungle songs for kids to gain popularity. That’s because jungle and wildlife become good theme for kids to learn about animals. So no wonder that some jungle songs for preschool is popular among children. Top jungle tracks also used for movies soundtrack, some notable examples are The Lion King or The Jungle Book soundtrack. Here are list of best jungle themed songs from time to time. All songs above are jungle themed songs, which contain some word and meaning jungle-related like animals, monkey, forest, lion or wildlife. Some classic hit like Guns N’ Roses’ Welcome to the Jungle and Creedence Clearwater Revival’s Run Through the Jungle is the most notable example songs about jungle that become populer and massive hit in rock music industry.